Supported by Northumbria University, this award recognises large and small scale events, festivals and exhibitions in Northumberland. The winners of each category qualify for the shortlist in the Overall North East Event of the Year award. Visitors to Berwick got to see the border town through the eyes of L.S Lowry in the summer of 2014. They found out that one of the UK’s best loved artists had a great love for the North East and was a regular visitor to Berwick and Northumberland from the 1930s until his death in 1976. The exhibition, staged by Berwick Visual Arts, celebrated Lowry’s connections to the region, bringing together a number of works he made on Berwick, including Dewar’s Lane, Spittal Sands and a Football Match on the ‘Stanks’ - all in his distinct style. It was the first time any of the works had been exhibited in the town. Organising the exhibition was a complex task involving an 18-month effort to secure the majority of loans from The Lowry, Salford and one of Lowry’s iconic painting of Berwick Market Place - with the help of Sotheby’s who sold it at auction two months before the exhibition. James Lowther, head of visual art, Berwick Visual Arts says: “It is wonderful that our ‘L.S Lowry in Berwick and Northumberland’ exhibition has been nominated for a Culture Award. The exhibition was our most ambitious to date and could only be realised with the support from a number partner organisations in Berwick and Northumberland. One of the oldest festivals in the North East hit a landmark 150th year at Woodhorn Museum with an amazing day of music, arts, comedy, heritage and celebration enjoyed by over 4,000 people. The day balanced the traditional and the contemporary, shifting from a show of community solidarity complete with mining banners and brass bands through to a programme of local and national artists including The Unthanks, Glen Tilbrook, Seymour Mace, Chris Connel and The November Club. The Pit Yard marquee saw performances from Ashington Male Voice Choir, WERCAS Folk and legendary folk musician Johnny Handle alongside a performance of excerpts from Lee Hall’s The Pitmen Painters performed by original cast members Chris Connel - who will be presenting The Journal Culture Awards 2014 - and Philippa Wilson. 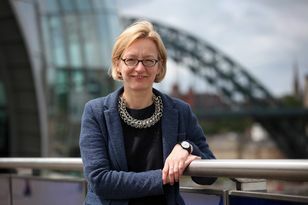 Keith Merrin, director of Museums and Archives Northumberland, says: “The 150th anniversary of one of the best-loved events in the North East calendar was always going to put a lot of pressure on the Woodhorn team to come up with an amazing programme. “We had to do justice to the memory of the coal-mining communities of the region and the many thousands of picnic-goers throughout the history of the event. Free running and Hexham Abbey are not easy bedfellows. Yet among 2014’s celebration of classical music- the 62nd Hexham Abbey Festival- internationally-acclaimed parkour and free running team 3RUN joined up with the musicians to create a unique experience for the assembled crowd. The family audience, many of who came specifically to see 3Run, were led around the impressive buildings of Hexham Abbey by the talented purveyors of parkour who have previously appeared in film and commercials, including a sequence in the James Bond film, Casino Royale. These events complemented the classical music elements of the festival by combining the modern with the traditional. The festival was dedicated to the fallen of World War One, music and arts conceived during wartime or directly inspired by it. Marcus Wibberley, Hexham Abbey Festival director, says: “We are absolutely delighted to be nominated for this award. The Hexham Abbey Festival has been trying for some time to really connect with people in the wider region, and for one of our events from the last Festival to be nominated Best Event Northumberland gives us a real sense that we are providing quality events that are appreciated across the region. Judges were on the look out for innovation, delighted visitors and the revelation of seeing collections and resources in a new light during 2014.